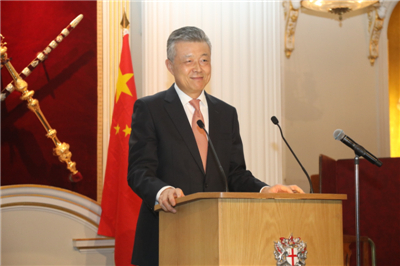 On February 8, Ambassador Liu Xiaoming and Madame Hu Pinghua attended the Chinese New Year Reception of the China-UK Charity Initiative co-hosted by the City of London and China Chamber of Commerce in the UK (CCCUK). Ambassador Liu delivered a speech entitled Promote Cooperation through Charity. 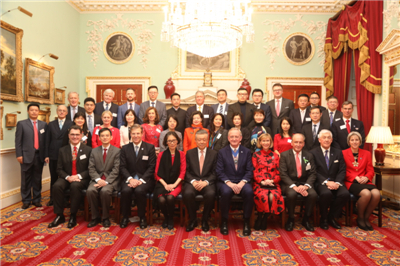 Over 200 people from various sectors of China and the UK were present, including Alderman Peter Estlin, Lord Mayor of the City of London and his wife, and Fang Wenjian, Chairman of CCCUK and General Manager of Bank of China. Ambassador Liu commended the City of London on its active promotion on China-UK charity cooperation. In his speech, he highlighted the unique role of the China-UK Charity Initiative in promoting cooperation between the two countries: First, it would be a catalyst for China-UK charity cooperation and give a fresh boost to the charity work in both countries. Second, it would be a stabiliser for China-UK economic cooperation and a new channel for the two sides to deepen mutually-beneficial cooperation. Third, it would be a bond between the people of China and the UK, promote cooperation and deepen friendship by charity to enhance cooperation in all sectors of the two sides. CCCUK and Chinese companies in the UK have set good examples in fulfilling their corporate responsibilities and serving the local community, the Ambassador said. He hoped that the China-UK Charity Initiative would achieve great success in facilitating the in-depth development of China-UK relations. 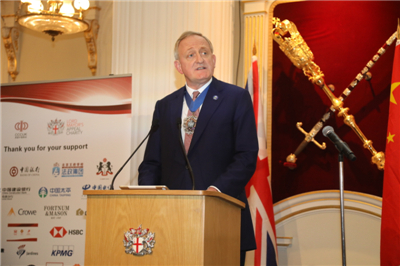 Lord Mayor Estlin said that China and the UK enjoy sound development in economic and trade cooperation, with ever-deepening cooperation in financial services. He will lead a delegation to China in March to further promote cooperation in Fin Tech and Green Finance between the two countries. The Lord Mayor’s Appeal aims at A Better City for All. The China-UK Charity Initiative could pool the strength of the City of London and CCCUK, and channel it into deeper China-UK charity cooperation in support of the public welfare undertakings in the two countries. 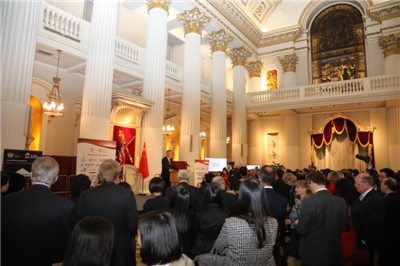 Fang, in his speech, hailed the sound cooperation between CCCUK and the City of London and called the China-UK Charity Initiative an important platform for Chinese companies in the UK to fulfill their social responsibilities and commitment to the charity work of the two countries. CCCUK is willing to work closely with the City of London to make contribution to China-UK charity work, Fang said. During the event, charity auction and lucky draws were held. 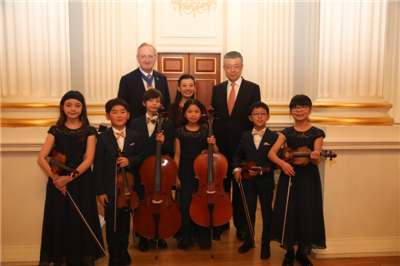 Students from China and the UK performed the music of the two countries, adding to the festival atmosphere of the event. The China-UK Charity Initiative was launched in December 2018, with the theme of “UK-China Charity, Building Harmony Together”. It aims to build a platform for China-UK charity cooperation. 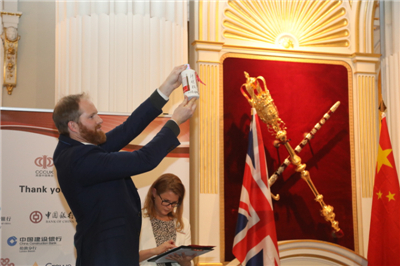 Money raised at this event will be used to support China’s public welfare projects relating to poverty alleviation and education, and the British charity projects under the Lord Mayor’s Appeal.